What Do We Owe Others? As director of the Shepherd Program, Howard Pickett focuses on bringing different voices to the table. Howard Pickett, director of the Shepherd Poverty Program, interacts with students in one of his classes. Q: Congratulations on your fifth year as director of the Shepherd Program. What brought you to W&L and this discipline? Q: What led you to teaching? Very early on, when I realized that I would not, in all likelihood, be drummer for the band KISS, I turned my sights elsewhere. Where I grew up, we didn’t have tutors. When students in my very small Mississippi high school were struggling with a project or a book or preparation for a test, I used to drive around from house to house and run homework sessions, because, well, that’s what I wanted to do. I wanted to talk about the books and the ideas. After college, I wasn’t sure what I wanted to study in grad school. Holly entered the Ph.D. program at UCLA, and I taught middle school and high school in Los Angles very happily for seven years. I went on to earn my Ph.D. in religious studies from the University of Virginia and began teaching in Shepherd full time in 2012. Teaching is pretty much the only job I’ve ever had, other than my college job working in the library. I can’t think of a better way to spend my time than talking about the most pressing moral and social problems that we face with bright, good, energetic young people. It’s awesome. 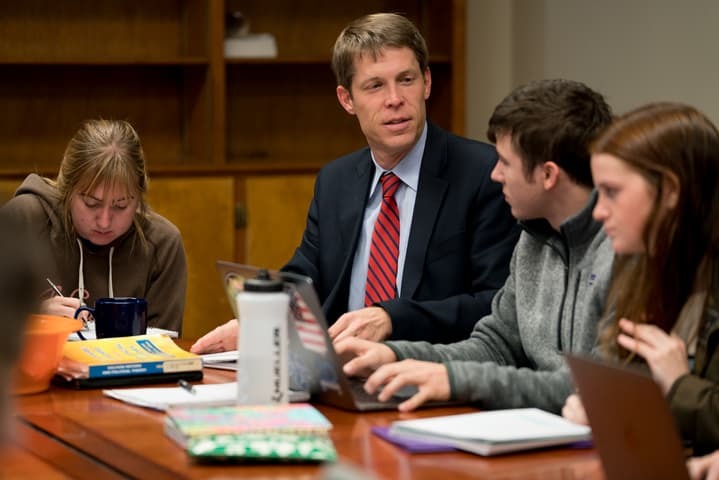 One of the appealing aspects of a place like W&L, and certainly one of the draws of the Shepherd Program, is that we get to have great classroom conversations. We get the scholarly engagement through conversations with colleagues across the disciplines. We get incredible insights from gifted Shepherd staff and community partners. And we also get the opportunity to mentor students as they figure out how to connect their own incredible gifts with the greatest needs of the world. For me, I really love doing research and I love teaching, but if I didn’t also have those one-on-one advising conversations with students about their summer internships and how they are going to build on those experiences in the coming years, my life wouldn’t be nearly as fun or nearly as fulfilling. Q: The Shepherd Program is celebrating its 20th anniversary. What drives the program’s success? Now for the longer answer. There are two important aspects of Shepherd that people might not realize if they aren’t heavily involved. One is that Shepherd’s focus has always been vocational. We’re preparing students to work with their future communities to address the problems associated with poverty. Sometimes that’s in their professional lives, but it should always be in their civic lives. Moving forward we’re going to clarify some of the more common vocational paths through the program, such as health, law, education, economic development and the like. The other aspect people don’t realize is that Shepherd is an embodiment of a W&L education. It actively cultivates both the intellectual virtues related to critical thinking and the civic virtues, including responsible leadership, service to others and engaged citizenship in a global and diverse society. Sometimes people think Shepherd is only coursework. Other times people think it is only community service. It’s really an interweaving of interdisciplinary coursework and community engagement. Shepherd has always been committed to bringing different people with different voices together around the table — people with different experiences, different backgrounds, different disciplines, different career paths and different political ideas. It’s our hope that students will learn how to participate passionately and respectfully in conversations about these pressing moral and social problems related to poverty with people who don’t always agree with them. Q: What role does the Law School have in the Shepherd Program? There’s long been a connection with the Law School, and I anticipate seeing that relationship expand and deepen over the next several years. Right now, we have at least four law student summer interns each year. We also have course work connections, notably each year a handful of law students with an interest in public interest law take the research seminar with our poverty studies minors. That’s a really fruitful interchange. You have students with an understanding of the law who are able to share that with undergrads who might be interested in a law career. Simultaneously, the undergrads have expertise rooted in their coursework and in their internship experiences that can directly inform discussions about poverty and law — everything from social determinants of health to housing issues to food insecurity. Over in the Law School, Joan Shaughnessy offers a course for undergrad and law students on child abuse and neglect. J.D. King, also a longtime supporter of the Shepherd Program, is quick to point out that his clinic, really all the Law School clinics, have a poverty dimension, though they exist apart from Shepherd. What we’re hoping to do over the coming years is to connect faculty and students in law and the undergrad side around those clinics. The Public Interest Law Students Association is taking the lead on some of that, too. 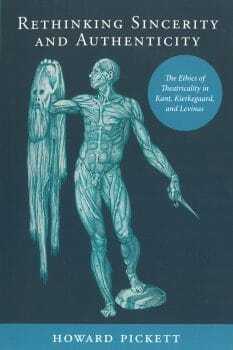 Q: You have a new book out, “Rethinking Sincerity and Authenticity: The Ethics of Theatricality in Kant, Kierkegaard, and Levinas.” What questions are you looking to answer in this project? I’m interested in the problems with excessive individualism. One could approach that by examining the obvious problems with people putting too much emphasis on their own individual interests, and harming others. But, instead, I’m interested in some of the ways our most cherished virtues and institutions may smuggle in excessive individualism. Specifically, I’m arguing that, in many ways, the modern emphasis on sincerity — on being true to oneself — is sometimes more vice than virtue. There are three problems with sincere self-expression. First, the self may not be worthy of expression. I may need to transform myself before its appropriate to go out and be the real me. I may often be an immoral and imperfect person; one doesn’t want to externalize the inner self if the inner self is pretty ugly. Second, the self might not be capable of expression. We frequently have conflicting feelings and judgments, and it’s difficult to figure out which one is the real me. The third problem is that all this focus on being true to one’s self — all this introspection — can actually sometimes distract us from the needs of others. Maybe I ought to be, not so much true to myself, as true to the other person. Ultimately, I defend what I call virtuous hypocrisy. I’m not making a wholesale recommendation of all hypocritical activity; I’m only advocating virtuous hypocrisy. More specifically, I’m looking at the ways some influential thinkers have described the ethical life in theatrical terms — imitating a moral exemplar, playing the role of the needy other. These activities actually play an important role in our own moral development and our moral deliberations about what we owe others. The problem, however, is that theatrical imitation can look a lot like insincerity or inauthenticity. Q: What do we owe others? A very important notion to me — even though the ethicists in my book don’t use the phrase — is “fake it till you make it.” I think that’s one of the big challenges in our lives. How do we overcome what for many of us is an obsession with our own self interest in order to become more concerned about the needs and well-being of others. Everything that we do in Shepherd is about learning how to be more understanding. How can we hear others’ stories more compassionately? How can we work in solidarity and partnership with our communities and community agencies to improve the well-being of all and to promote a more just world? Everything Shepherd does is a rejection of excessive individualism in pursuit of a more collaborative community. Getting there requires community engagement, participation in internships, working with community partners and examining complex problems from different disciplines and perspectives. Shepherd is all about recognizing both our own limitations and the value of others. Q: Who do you like to read? If I had to pick one author to read and teach, it would be Martin Luther King Jr. — in particular, his final years, when his focus turned more and more to issues of poverty and economic justice. But my students wouldn’t be surprised to hear me also say John Rawls and Martha Nussbaum.